Rise above the land and water with this paragliding adventure, which takes you soaring over a lake and past the Twin Falls before a gentle landing. Relish the adrenaline of the flight or appreciate the view. 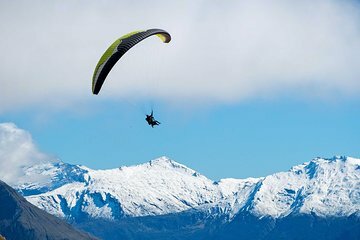 Strapped to an experienced paraglider, float down in air currents; this is a unique way to enjoy spectacular Wanaka. The base of Treble Cone mountain, on the Wanaka-Mount Aspiring Rd. 25 minutes drive from Wanaka.